How to deal with cat biting and scratching. Tip: Give cats their own scratching place. Most biting and scratching problems are due to a simple misunderstanding of the cat's basic needs. They do not intentionally try to ruin the furniture or the carpeting. They merely see those items as convenient and desirable things on which to groom their claws and stretch their toes. It just feels good. Even a declawed cat will "scratch" on things. Scratching: It is natural for cats to stretch their toes and shed their claws as they grow - sort of like humans clipping their nails as they grow. People see this as "sharpening their claws." The claws do become sharper, but only because it's the new nail coming in when the old one is pulled away. Cats are not scheming to do damage with this; it's instinct that drives them to groom their feet this way. After all, they can't run down to the store and buy clippers or nail files. If you don't want them scratching you or the furniture, you will have to develop some new routines or options for them to accomplish this personal task. Offer a scratching area, such as a post, or a board with a nifty scratching surface, for example. You will have to experiment to see what works best in your home. As with humans, cats have different personalities, personal preferences and habits. Declawing, pros and cons: Certainly, declawing will save the furniture, your slacks, the carpet, and other things at home. This subject is fraught with controversy, though, and the arguments abound on both sides of the issue. Declawing is mutilation; the last digit of the toe is surgically removed, leaving the cat with a very painful recovery phase, which we have seen to last as long as a year in some cases (large cats, in particular, because of their weight). They learn not to trust you, become more fearful, and may become accomplished biters. If they are teased, taunted, harassed or "played" with too vigorously, they become very afraid and WILL bite. If, on the other hand, the cat is supported by loving attention and gentleness, they will not bite. 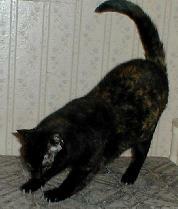 Several of our declawed cats are gentle, loving kitties and have never bitten anyone. But we can guarantee they have never been handled too roughly by humans. Our policy with adoptions is that if the cat can be guaranteed a loving home, and declawing is the only way they can have this home, we do not object. (We cry, but we do not deny the adoption.) Another option is to apply claw covers, such as Soft Claws, plastic nail covers available at some pet supply stores. Also, many cats can learn to accept having their nails clipped. Just be sure to do it correctly to avoid hurting them. Click to obtain an article on proper nail trimming.